Jester King | Beer Apprentice - Craft Beer News, Reviews, Interviews and Info. Now what’s happening everyone? Drinking beer? Well, I’m about to. For today’s craft beer review I’m going to be sampling the Das Überkind made by the Jester King Craft Brewery positioned in Austin, Texas. I may have mentioned this before, but I’ve had some mixed reactions when it comes to Jester King. I sure hope that this one is doesn’t disappoint. From the website, jesterkingbrewery.com, I stumbled upon this description. Ok. Let’s get to this. It came in a 25.4 oz. bottle with an ABV of 6.5%. The brew poured a semi clear, golden/honey color. An easy pour produced a small, white head that had a fizzy and soapy texture. The retention time lacked a little as did the lacing, but it still looked fairly attractive standing in the snifter. The nose brought about a nice sourness. Tones of white grape with a subtle, but pleasant oakiness. It was semi-musty and semi-funky. Some spices were accounted for as well as some earthiness. After it warmed a touch I began to discern an odd doughy biscuit scent. Hmm. It wasn’t distracting or anything… just different. The flavor discharged a medium sourness and tartness. Light green apple skins and white grape. Quite white wine like I thought. Some of the woodiness was unhinged toward the end. The medium strength funk stayed consistent throughout. Lying underneath was a solid yeast and coriander type spice savor. The mouthfeel was medium bodied. It was slightly sharp, crisp and bitey with good medium strength carbonation. A lot of flavor was left behind on the palate after each sip too. Yeah, I thought this to be a very nice beer. It got much better as I went along in both the aroma and the taste. It became a lot more harmonious also. It had a great drinkability and I’d be more than happy to pick this up again and I would be more than happy to recommend it to anyone that’s interested in craft beer. So, if you can get Jester King products, pick up the Das Überkind and see what you think about it. I’ll say that it’s probably one of my favorites from them. Not that that matters really. Hello everyone. For today’s craft beer review I’m going to be trying another beer from the Jester King Craft Brewery located in Austin, Texas. The brew I have lined up this time is called the Commercial Suicide. Let’s forego all of the small talk and jump directly to the website, jesterkingbrewery.com, and see what the commercial description has to say. English pub ale meets the French farmhouse tradition and American oak aging in this dry, drinkable farmhouse mild ale. Full-flavored, but brewed with enough restraint to be highly sessionable. Unfiltered, unpasteurized, and naturally conditioned. This beer came in a 25.4 oz. bottle and it possessed an ABV of 3.5%. The brew poured a dark brown color with a deep ruby sheen. It was almost like an oxblood color. The crown was light tan, sized well, smooth, mostly creamy and soft. The retention time wasn’t bad and the lacing was ok too. The aroma began with some sort of spice. I couldn’t really put my finger on it though. It also released hints of toasted grains along with some walnut type of indication. It also had a light woody/oak profile, a touch of caramel and just the slightest note of chocolate. I didn’t really discover any of the farmhouse qualities that these Jester King brews seem to have however. The flavor started rather nutty with savors of toasted grains and toasted bread crusts. It released some type of mineral component that became somewhat distracting. Once past that I got a little bit of the chocolate, although I didn’t detect any of the wood or oak or farmhouse yeast. The mineral aspect didn’t do this beer any favors as far as creating a harmonized or very pleasant taste. It seemed to dominate as I went along. The mouthfeel was medium to medium/thin bodied. It was smooth, but it became a touch watery. It was actually more crisp than I had anticipated. The carbonation was good though, yet only an “ok” amount of flavor was left behind on the palate after each sip. Overall, I only found this beer to be decent. It’s very easy to drink, but I just kept becoming distracted by the considerable mineral indication. I’d still say give it a try though. As I always try to emphasize, this is just my opinion and it really doesn’t amount to a hill of beans when it’s all said and done. 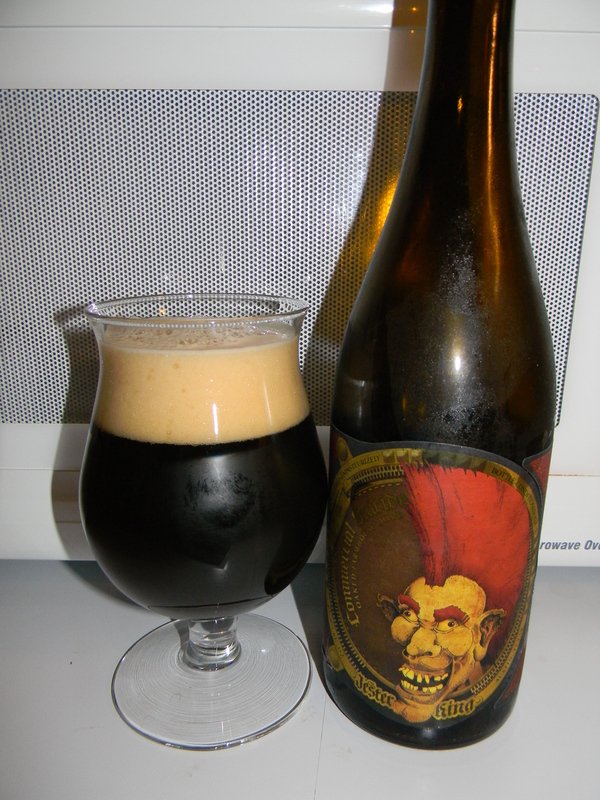 So, the next time you are beer shopping and you see the Jester King Commercial Suicide sitting on the shelf… pick it up and give it a try. You may find some very interesting facets of the brew that appeal to you that I may have missed. Be sure to let me know of your thoughts if you’d like. Hello everyone. 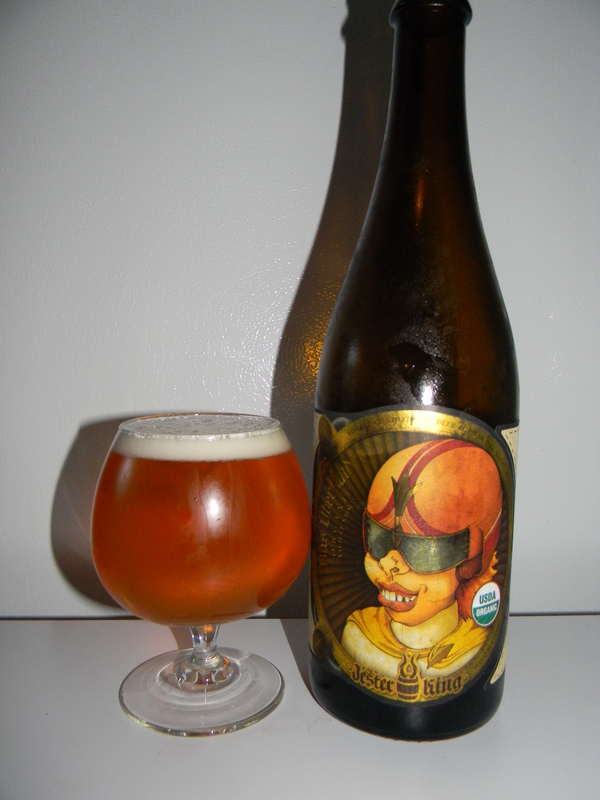 For today’s craft beer review I’m going to be tasting the Jester King Buddha’s Brew made by the Jester King Craft Brewery located in Austin, Texas. All of these Jester King brews that I’ve had so far have been really tasty, so I’m looking forward to giving this one a go too. From the website, jesterkingbrewery.com, we find this description of the Buddha’s Brew. The first Jester King beer to be fermented entirely in oak. Unfermented wort was racked directly to oak barrels and inoculated with souring bacteria. From there, it spent months aging in our barrel room before being blended with live kombucha at bottling. Unfiltered, unpasteurized & naturally carbonated through re-fermentation in the bottle. Sounds good. Let’s have a sip. This beer has an ABV of 4.7% and it comes in a 25.4 oz. bottle. It poured a mostly clear, radiant, golden color. It formed a white head of decent size from an easy pour. The texture was sudsy, soapy and fizzy. The retention time lacked a little bit and not much lacing was left behind as it subsided. It got a lot more hazy as I poured the bottom third of the bottle. Still an ok looking beer though. The aroma consisted of white grapes and hints of lemon. Both of which produced a very light tart smell. Evidence of wood and a meager amount of barnyard funk were found as well. Tones of grass and wheat became more apparent as it warmed. Honestly, I didn’t get a whole lot of the kombucha tea that was mentioned in the commercial description. It wasn’t a bad aroma though. Quite good actually. The taste released a very relaxing sourness and tartness. Not “lip puckering” at all. More of the grapes and lemon citrus, but again, very manageable and easy going. Some funk was available, however not an overabundance. A light relish of oak protruded on the back end and the grassiness became stronger as I went along. Still no tea however. The mouthfeel was medium to medium/thin bodied. Smooth, but crisp, dry and refreshing. The carbonation was lively on the tongue and a sturdy amount of flavor was left behind for me to enjoy between sips. Overall, I thought this to be a respectable beer. It was very easy to drink and it would pair very well with the upcoming Spring and Summer season. Enough character was available to keep me interested for the entire drink that’s for sure. Now, I don’t think it’s on par with some of the other Sours that I’ve tried in the past, but I do believe that this beer could be enjoyed by most anyone looking to explore the style and I think that it is acceptable enough to be appreciated by even the most advanced craft beer geek. 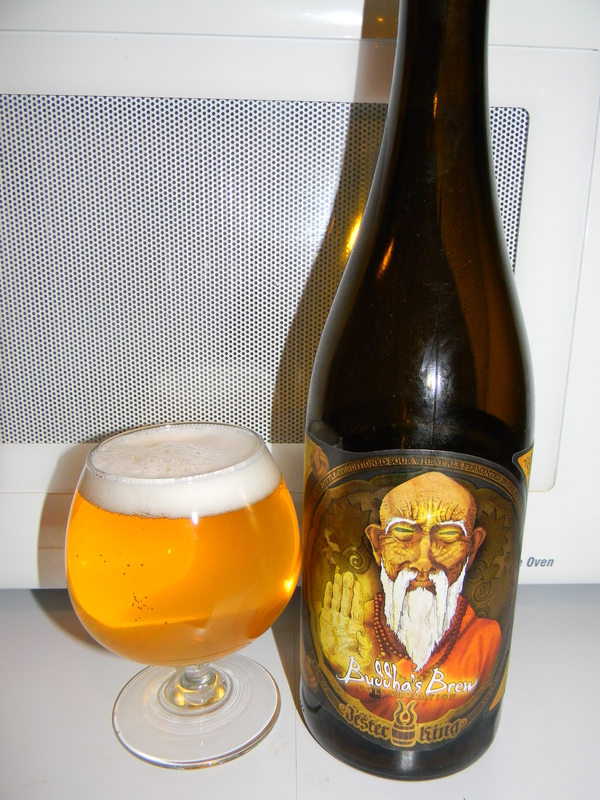 Either way, pick up the Jester King Buddha’s Brew the next time you see it and give it a try. I’d love to hear another opinion. Thanks for reading everyone. Don’t be afraid to comment.